Twenty one, count them, 21 spaces where stickers used to be! Now there are a couple of stickers necessary for branding, but that only accounts for four of them. Another four went towards the full effect of the front grill. Other labels go towards adding details such as the indicators and brake lights. But several stickers exist almost for the sole purpose of changing the color of the base element: A 2×2 white space in the middle of a 2×4 tile, and black stickers on the back of the cabin to represent the rear window – occupying most of a 2 x 4 slope. Without the stickers, aspects of this set look a bit bland. There are a few obviously unlabelled tiles on the roof of the car, breaking the white racing stripe down the middle of the vehicle. The front grill is decidedly missing, and then the back of the vehicle is also missing four labels (some of them glaringly absent). No stickers here: It is certainly missing something. So…why don’t I like to stick a sticker onto my sets as I build them? I may wish to use the stickers more creatively in a MOC in the future. There are some who manage to do this. In reality, I am more likely to want to use the piece with the sticker on in a MOC in the future. Accuracy in placement is difficult. I am all thumbs. And as I get older, I find that poor lighting and reduced visual acuity just make this all the more difficult. Not to worry: this is in fact a task that can be enhanced by the brick separator if available; or the use of the spanner tool. Oh look, there is one in this set. It’s not just for removing hubcaps. Placing the corner of the sticker on the tool does make it a lot more stable, and it makes the job of applying the stickers much easier. Thumbs can be awkward and fiddly, especially if you are over twenty years of age. Our driver demonstrates that the spanner is not just for removing hub caps! And then there is the psychological reason. This is probably the big one: Like an embryonic stem cell the majority of Lego pieces have infinite potential: Once a sticker is applied, there is a cognitive barrier to re-using the piece. This is an existential crisis for a piece of lego: the sticker cannot be easily removed, or indeed reused for that matter. This plate is now a mustang grille; that one is a tail light, that one is an indicator. 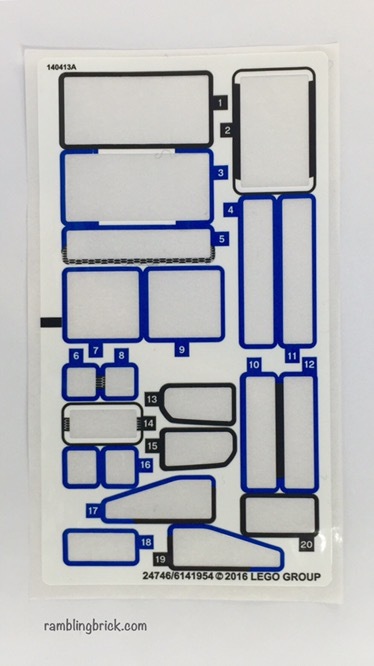 If all of the stickers have been applied to a model, you are less likely to choose to disassemble that model, and return the pieces used to the general pool for later use. It is as if once a sticker is applied, a LEGO piece loses its potential, and a previously unlimited toy/sophisticated interlocking building brick system is severely restricted in its use. This finality of purpose is anathema to LEGO, where every piece has near unlimited potential. Until stuck down. In the early 80’s, some stickers were applied across multiple laters of bricks – for example the movie screeen in the 6000 Ideas Book. At least now panels mean such stickers only affect one piece. So, if I don’t want to use stickers, what are my options? Some of these tiles have a greater variety of uses than others. So: there are swings and roundabouts here. At least the printed parts still have the markings on after 5 years. Don’t place all the stickers: be selective: Some stickers are essential for a model’s identity. Without the Batsymbol, it’s not Batman- you have to use that one. But probably not the others. Aspects of the model will still look sparse, but the important parts will be there. Of course, brick building these parts does not really allow the distinguishing licensing marks to be applied as readily.- such as the horse on the grille of the Mustang (OK… the mustang on the grille of the Mustang). How I learned to stop worrying and to love the decal. Perhaps the reality is that with some of these sets, we buy them for the model, rather than the pieces (Dragons, I’m looking at you here – you are all part fodder; the car – less so). In this situation, perhaps we are better to relish the build, placing the stickers – or at least the important ones if the set is for display. We need to recognise that stickers add to the time required for the build, and allow for it when we place them. Strong lighting is essential, and a tool to assist with placement is essential: spanner, brick separator or good old fashioned tweezers. And put your reading glasses on. Go on. Do it now. You are probably not even wearing them to read this. Do I need a Mustang? Put on the stickers! Do I just want a cool car that looks like a car: change a few specific pieces. As with most LEGO modelling, a degree of compromise is necessary. Perhaps we can all learn something from that. So…how did I like the set? I found the build quite satisfying. The car is certainly out of scale with ‘typical LEGO car sets’ in the city range. The longer length and breadth were certainly an improvement to increase the level of displayable detail. The final model is extremely ‘swooshable’ and zooms along the floor nicely after a solid much. No aspect of it feels flimsy. The stickers were fiddly, even with the aid of a tool to place them, and for me were the main disappointment of the model. Many of them are not essential for a great car build – so do what you wish! Good representation of the car it purports to be. The fact that in 5 years time many of these stickers will probably peel, blister and crack! I’ll give it 4/5 Arbitrary Praise Units up until I started to place the stickers. Then it lost most of its virtue! If you like cars, this is a satisfying build, but I suspect you will find the same from any of the current Speed Champions line. Just get some reading glasses to help you line up the stickers! How do you deal with stickers in sets? Apply all? Apply Selectively? Ignore? The time has come to overcome the existential crisis and consider what you are building for! I always filly sticker my builds, sometimes as I go, sometimes once the set is complete; it depends on my mood. I’m very much a buy-the-sets-for-what-they-are type of person, rather than being into free builds and MOCs, and I am also getting very good at stickering my Lego pieces. I recently built the Scooby Doo Mystery Machine – sticker hell – but 19 out of the 20 stickers was spot-on, thanks to my experienced, steady hand.